Rare footage of Nirvana playing their last ever gig in Los Angeles has been shared online by a documentary maker who filmed it. Dave Markey, who was close to the band, posted the footage he shot in December 1993 at Los Angeles' Great Western Forum, on YouTube. He recalled: "I stood on Kurt's side of the stage at my hometown's Los Angeles Forum and captured the last set I would see of this band. A band that I had worked with, toured with; people that I would call my friends. A band that both the world and myself really loved (can't really say this has happened since). Within just a few short months it would sadly all be over. "I'm glad to have documented this show, as well as their pre-fame fun in 1991." The band - whose members included Foo Fighters star Dave Grohl - split in April 1994 after frontman Kurt Cobain committed suicide aged just 27. Nirvana are to be inducted into the Rock And Roll Hall Of Fame on April 10, 2014. 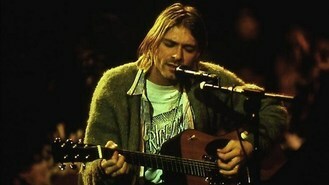 The city of Hoquiam in Washington has declared April 10 "Nirvana Day". Kurt Cobain once lived in Hoquiam, and the town is only four miles from Cobain's hometown of Aberdeen. Veteran star David Bowie is up for two Brit Awards in the wake of his comeback - three decades after he first won a prize at the annual music bash. OutKast are reuniting to headline the Coachella Valley Music and Arts Festival in April. Beyonce surprised fans who were singing one of her songs in a karaoke booth - when she turned up and joined them. Carrie Underwood has joined the line-up for the first iHeartRadio Country Festival. Metallica are to perform at the Grammys with Chinese concert pianist Lang Lang. Ed Sheeran has confessed he "fell in and out of love" with his new album. Lily Allen has revealed she regrets turning down "hundreds of thousands of bitcoin" as payment for a live performance. Lady Gaga has claimed she has been "betrayed" by people around her, which has led to delays and problems with her latest album, ARTPOP. Rihanna has announced the title of her duet with Shakira will be Can't Remember To Forget You.